Over the last two months, Syrian president Bashar Assad has launched a massive shakeup in the country's military-intelligence complex, reportedly on the advice of his brother-in-law, Maj. Gen. Assef Shawkat, the deputy chief of Syrian military intelligence, that has already resulted in the ouster of several members of the late Hafez Assad's inner circle. While Assad's consolidation of power over the network of overlapping security agencies inherited from his father had been widely expected, the economic and political implications are not yet clear. The so-called "Old Guard" within the security apparatus was widely seen as having ended the initial wave of limited political liberalization which swept through Syria from July 2000 to February 2001 [see Dark Days Ahead for Syria's Liberal Reformers, February 2001] and remained in limbo until the arrests of several leading opposition figures last fall [see Syria Arrests Leading Dissidents, September 2001]. Moreover, the security chiefs are often blamed for the fact that many economic reforms advocated by Assad and his allies in the business community have not been implemented [see The Political Obstacles to Economic Reform in Syria, July 2001]. Both views are over-simplified, however. Political and economic change is obstructed not so much by an identifiable clique of particular individuals in Syria, but by a system that allows elites in the military-intelligence apparatus to thwart civilian political institutions. The infusion of new blood into the security apparatus will not dramatically enhance prospects for political and economic liberalization over the long term unless the young Syrian leader reduces the power of the security apparatus as a whole. Assad's supporters say that the president is slowly seeking to shift power from the security agencies to the civilian cabinet. While there is some evidence that this may, in fact, be his intention, the changing of the guard currently underway at the pinnacles of Syria's military-intelligence apparatus is at best a preliminary move to reduce resistance to a fundamental overhaul of the system that has not yet begun and may not happen at all. Whether the changes will bolster Assad's authority in the short-term is also unclear. The decision to undertake the shakeup comes at a time when tensions in the Middle East are high and the short-term horizon of regional developments is difficult to predict. Assad may have wagered that disaffected ex-security barons will not dare make a move to unseat him under the present circumstances for fear that this might undermine national security. On the other hand, with rumors circulating that additional purges of the upper and middle echelons of the military and security agencies will be undertaken later this year, remaining members of the Old Guard may decide to strike before personnel changes eliminate their ability to mobilize support for a putsch. Aslan, who was appointed in July 1998 after the ouster of Hikmat Shihabi, reportedly ran afoul of Shawkat, the president's brother-in-law, who has taken charge of all major military appointments and dismissals since Assad's ascent in June 2000. The two have reportedly clashed repeatedly on the issue of personnel changes. Informed Syrian sources believe that Aslan's removal is a prelude to an extensive purge of the upper and middle-level officer corps. This would pave the way for a new agreement, initialed during the visit of a Russian military delegation in January, to send new Syrian commanders to Russia for training, apparently with new tanks, aircraft and air defense systems and upgrades that Damascus is planning to purchase in the near future. Although Damascus has cancelled several military contracts in recent years for lack of funding, it is expected that much of the new revenue Syria has derived from imports of Iraqi oil since the Fall of 2000 will be allocated to the military. The appointment of Turkmani, a Sunni Muslim, may also be intended to restore a touch of sectarian diversity to Syria's military-intelligence establishment, which has been thoroughly dominated for the last three decades by Alawites, members of an offshoot sect of Shi'ite Islam who constitute only 12% of the population. 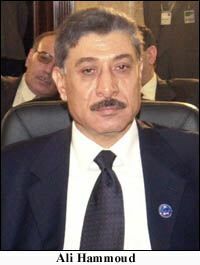 Until the July 1998 ouster of long-serving chief of staff Hikmat Shihabi, who held the post for over 24 years, this position was one of the few high-ranking positions held by a Sunni. The appointment of Aslan, an Alawite, to replace Shihabi had fueled criticism that the military was being further "Alawitized." Nevertheless, Turkmani is clearly qualified for the position. 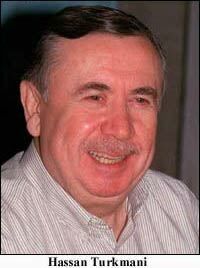 Born in Aleppo in 1935, Turkmani enrolled in the military academy in 1954 and graduated as a field artillery lieutenant. He commanded a mechanized division during the 1973 Arab-Israeli war, apparently with distinction. He was promoted to the rank of major general in 1978 and has written several books on military topics. Earlier this month, Syrian officials confirmed that the head of military intelligence [Shu'bat al-Mukhabarat al-Askariyya], Maj. Gen. Hassan Khalil, will retire shortly. It is not yet clear who will replace Khalil, who was appointed to the position in early 2000. This is an extremely important position. Aside from the usual range of defense-related surveillance and intelligence gathering, Syrian military intelligence is responsible for providing support to Palestinian and Lebanese extremist groups and monitoring political dissidents abroad. Moreover, the powerful Lebanese branch of Syrian military intelligence, headed by Maj. Gen. Ghazi Kanaan, exercises de facto political authority in the country with relatively little oversight from Damascus. Four months prior to his father's death in June 2000, Bashar engineered the ouster of Syria's long-serving chief of military intelligence, Gen. Ali Douba, who was regarded as a potential threat to his ascension to the presidency. Although Douba was nominally succeeded by Khalil, he has largely been a figurehead, with real authority being exercised by his deputy, Shawkat. While it is possible that Shawkat will officially ascend to the helm of military intelligence, the Syrian president may appoint another figurehead to mask the growing power of his brother-in-law. According to Syrian sources, the head of the Air Force Intelligence Directorate [Idarat al-Mukhabarat al-Jawiyya] since 1987, Gen. Ibrahim Hueiji, retired earlier this year. The AFID evolved into the country's most secretive intelligence agency under the late Hafez Assad, who was commander of the Syrian Air Force prior to assuming power, and has been assigned sensitive domestic and international missions. MEIB has been unable to confirm who Hueiji's successor is. Significantly, Aslan and Hueiji were both offered positions as advisors to Assad, reflecting either a desire on the part of the young president to keep experienced men at his side amid the infusion of fresh blood into the military-intelligence apparatus, or a desire to keep tabs on them. Whatever the reason, both men wisely accepted the advisory positions. The fifth notable personnel change came in the General Intelligence Directorate [Idarat al-Amn al-Amm], the main overarching civilian intelligence service in Syria, itself comprised of three powerful divisions: internal (equivalent to the FBI), external (equivalent to the CIA) and Palestine, charged with monitoring Palestinian activity in Syria and Lebanon. Last year, Assad replaced the head of the GID, Maj. Gen. Ali Houri, a member of the Ismaili sect, with Gen. Ali Hammoud, an Alawite (another move that fueled fears that the regime was being "Alawatized"]. In December, however, just months after his appointment, Hammoud [see below] was appointed interior minister and Maj. Gen. Hisham Bakhtiar, a Sunni who was previously chief of the Palestine division of the GID, was promoted to the position. Bakhtiar, who is in his early 60s, is said to be very close to Shawkat. During the cabinet shuffle that took place in December, only one politically relevant ministry changed hands - Interior Minister Muhammad Harba was replaced by Hammoud. As with most other ministers who were ousted, Harba was said in the state-run press to have been regarded by Assad as too bureaucratic and complacent. However, Harba's replacement by Hammoud is more reflective of the new role that Assad envisions for the Interior Ministry. According to well-placed sources in Damascus, the Interior Ministry will assume some of the responsibilities previously carried out by various security agencies. The rapid promotion of Hammoud, who had been in his previous position as head of the GID for only several months, therefore indicates that Assad has placed considerable trust in him. Hammoud's background in both military and civilian intelligence agencies is also significant. Prior to Hammoud's appointment, interior ministers in Syria were often elevated from the ranks of the civilian police and had relatively little clout vis-a-vis the security apparatus. Hammoud's familiarity with Lebanese politics may also have been a consideration. Having previously served as the head of Syrian military intelligence in west Beirut, Hammoud may also enhance Assad's ability to monitor (and understand) developments in Lebanon without relying on Kanaan and the local Syrian military intelligence apparatus. 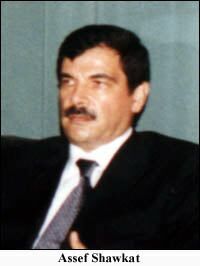 Dossier: Assef Shawkat, Middle East Intelligence Bulletin, July 2000. Dossier: Mustafa Tlass, Middle East Intelligence Bulletin, July 2000. Syria Replaces Veteran Military Intelligence Chief, Middle East Intelligence Bulletin, February 2000. 1 The Jerusalem Post, 25 January 2002. 2 Al-Dustour (Amman), 12 February 2002. � 2002 Middle East Intelligence Bulletin. All rights reserved.